"The government’s bill on asylum and migration, debates on which start today, is a rare indigence in the fight against immigration. We will try to amend the text during the parliamentary discussion. 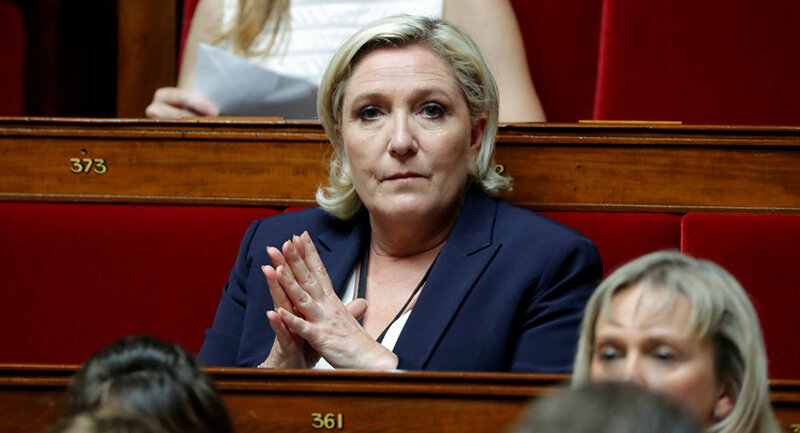 Given the importance of the issue and in order show the consistency of our roadmap, we wanted to present a complete counter-proposal, presenting the French people an alternative immigration policy," French right-wing National Front (FN) party leader Marine Le Pen said during a press conference. ​The party’s leader stressed that immigration was a great issue of the 21st century, which puts the French civilization at stake. She also stated that in its draft, the party proposed the reform of the nationality law, as well as to abolish dual citizenship without exception, as well as to enforce the measures enabling to deprive nationality. Le Pen also stressed that in order to be a French citizen, one must "want and deserve it." The French parliament’s lower house, the National Assembly, has started discussing the government's bill aimed to put immigration under control, as well as to make asylum regulations more effective. France, as well as a number of other European states, has been significantly affected by the ongoing migration crisis. In 2017, over 100,000 migrants and refugees applied for asylum in the European country, which became the highest number in the past 40 years. The National Front advocates the struggle against undocumented migration, opposes French EU membership, and supports protectionism and traditional values among other issues. The party holds eight seats in the 577-seat National Assembly. In the recent presidential election, Marine Le Pen finished second.